My self-care routine is always evolving, because I’m always growing, learning, and needing different things. You’ve likely noticed the same for yourself as well if you have ever followed a consistent self-care routine. I feel like in the last year, my self-care routine took a sharp turn towards the mystical and magical! This past year I was introduced to the moon phases and all of the magic they bring, oracle cards, healing crystals and spirit guides. I shed many tears of awe and joy from the deeply intense feelings of connectedness and divine guidance I received. So for this year, there are a few new additions going into my self-care routine. And here is what I recommend to anyone: create time for self-care, otherwise, it will get put on the back burner. Knowing that I have time carved out for self-care helps me to release anxiety and stress because I can anticipate alone time to recharge and connect with myself. Look at your month and then look at your weeks–where can you make time for yourself? Here’s what I’m looking forward to this year in my self-care routine. The moon is perfect because she is our constant reminder of magic, energy, the Divine, and to stop and connect with ourselves. I plan on doing four monthly self-care rituals that follow the energy of the moon and using the moon ritual sheets. This means I’ll have a weekly date with myself and spirit guides to look forward to! I’ll be setting intentions that I want to manifest every New Moon, taking inspired action every Waxing Moon, celebrating with gratitude every Full Moon, and releasing and resting every Waning Moon. These rituals are the most restorative for me because my kids are in bed, the house is quiet, I have very soft lighting on, and I’m connecting with myself and the Divine. I’m not a morning person so my morning routine has never been extensive. I also homeschool my two sons who are early risers, so my house is always nice and loud when I wake up. But I still find it so beneficial to take anywhere from 10-30 minutes to be intentional. I frequently share my morning routine on my Instagram stories. If I have more than 10 minutes, I light incense, read a few pages from a daily book, and then fill out a morning worksheet. All of the bundles in the shop come with a morning sheet because I find them so powerful, so pick out a bundle that speaks to you and incorporate the morning sheet into your daily routine. All of this takes me less than 20 minutes and seriously makes such a difference in the way my day manifests and unfolds. This year I plan to focus more of my time on reading inspirational books. Nothing gets my mindset into a more powerful mode than when I’m filling it with words of inspiration and encouragement. I tend to get into a bad habit of just scrolling my phone before falling asleep. This lets other people’s moods and stories be the last impression I leave on my subconscious mind, which is no bueno. Right before we fall asleep is the PERFECT and BEST time to imprint what we want in life onto our subconscious minds. Reading even a page or two from a book like Wishes Fulfilled before I fall asleep is enough to get me into that higher, powerful vibration. My favorite thing to do is highlight passages in my favorite manifesting books and re-read over those passages before I fall asleep. 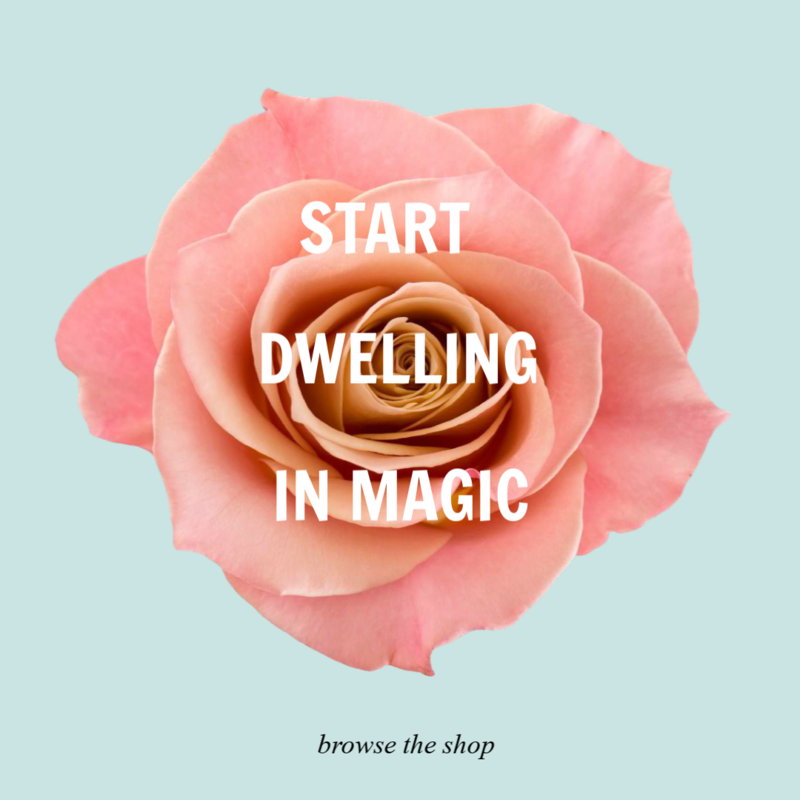 If you’re not already in the Dwell in Magic Facebook group, I invite you to come join us. We choose a book once a month that revolves around the topics of manifesting, self-care or moon magic. I’m a homeschooling, work-at-home mom so I do most of my self-care once my kids are in bed. Back when they were younger and I was breastfeeding, I did a lot of reading inspirational books while nursing or laying next to them while they fell asleep. I’m always looking for where I can make the most of my time. I also had a discussion a few years ago with my husband and we agreed to take turns putting the kids to bed so that the other parent can have the evening “off”. So every Monday and Wednesday night he puts the kids to bed and I know I can “clock out” of parenting duties at 6pm. If I worked outside the home, I would listen to inspirational podcasts on the way to and from work. I’d read or write in my planner/journal on my lunch break. If I was single or had a partner that worked a lot, I would do self-care once my kids were in bed, which is what I do most often myself anyway. I would start small and not feel like my self-care time has to be a big production or perfect. I’ve also written here about how to get started with self-care. A planner of some sort where you write down your intentions/goals/dreams and refections. This is all I started with several years ago when I began this delicious unfolding into sacred self-care. I was basic as hell! I had my journal, planner, books and Norah Jones. And my life began to transform. Self-care routines can be broken up and sprinkled throughout your day. It doesn’t need to be this big thing that takes up an hour or more (although that’s a lovely way to spend your time if you have the opportunity). What’s your self-care plan for this year?! I’d love to read about it in the comments! 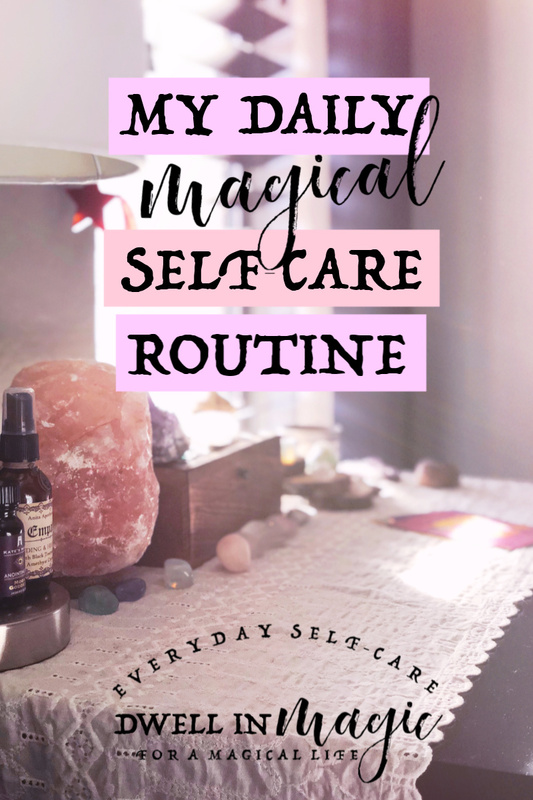 For more self-care inspiration, connect with me on Instagram, the Dwell in Magic Facebook group, and sign up for my newsletter if you’d like to receive updates on new self-care blog posts. Jessica, I so appreciate the reminder to not dive into mindlessness before bed. That can be when Netflix or Facebook happens for me. I’m going to adopt your habit as my own – I LOVE this, “Right before we fall asleep is the PERFECT and BEST time to imprint what we want in life onto our subconscious minds.” There are so many inspirational books I could be filling my mind with – and will be starting tonight. I also followed your moon ritual oracle practice beginning late last year and they are a winner! Thank you! So glad to hear that Janice! And yes, I try to remind myself of this every day about the whole falling asleep while reading or thinking about something that I want to sink deep into my subconscious mind. Thank you for commenting! I keep a journal to assess my day and to write all my plans and goals. I wanted them to be written so I can glance on them when the year ends. Yes, I love that Cassie!